*Coming in October, the family of Whitney Houston will expose all of the emotional baggage, private laughs and communal struggles since dealing with the loss of the singer. The show was first announced last May, and will star the sister-in-law and former manager of the singer, Pat Houston. Of course the young and lost Bobbi Kristina is at the center of the family’s concerns, as the aunties attempt to steer her in the right direction. Originally scheduled to extend only 10 half-hour shows, the network stretched it out to 14 episodes. “The Houstons: On Our Own” will debut Oct. 24 on Lifetime. 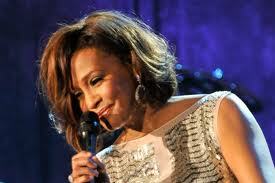 Also, the network announced a special one-hour special “Remembering Whitney” to air on Oct. 17. I’m so over people exposing their lives on reality television. The Houston’s lives played out in the media and on the news and there is nothing new under the sun, or that we need to know about. Besides that, wasn’t it this same sister in law that sold those pictures of the crack scattered bathroom Whit spent too much time in? Enough already, just get the little girl together before she meets the same fate and the world will be content. This is NOT A GOOD MOVE people ..Folk STILL trynna make money off Whitney…disgusting! and none I’ve seen crawl out the woodwork YET is capable or qualifying enuff to advise the daughter — sad …Money–the Root of all Evil..and FOOLISH! They need to get in a line and sing I LOOK TO YOU (Lord)! why is everyone hatin on Pat? Whitney’s daughter is part of this too. If she is old enough to decide she doesn’t want to deal with her father, then I would think she’s old enough to see through this reality show BS. And didn’t Whitney’s mama release her first CD in 15 years– right after Whitney’s death? But yet, we focus on Pat.. I agree with Redtopp 100 %. They are attempting to capitalize off of Whitney’s death and it’s truly disgusting. Remember only Bobbi Kristina was named in the will – this family seems bent on gettin paid come hell or high water! Pat was her manager, she doesn’t manage any other artists/groups? I guess Whitney was her only client in life and will remain her only client in death! Absolutley triflin!